UrbanGlass is an open-access facility where over 380 professional artists and designers create using glass. Our facility fosters community and serves as an incubator for creation and innovation. UrbanGlass’ 17,000 square foot state-of-the-art studios are filled with natural light and the best equipment available. 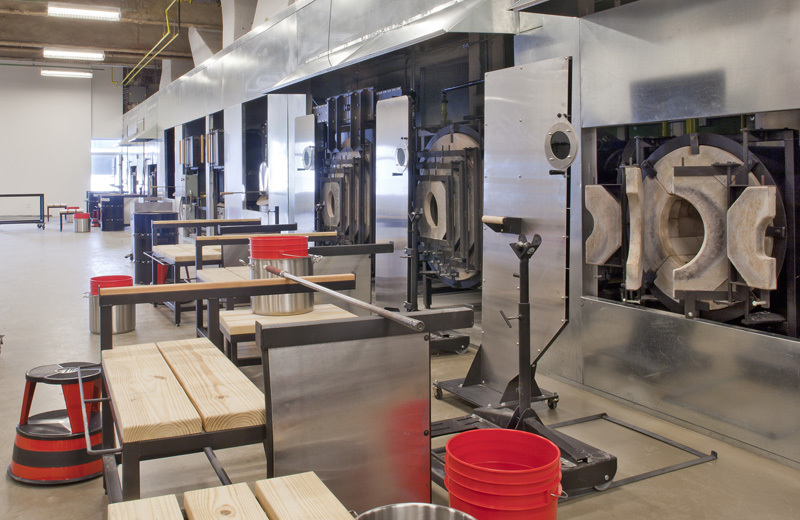 The facility includes a hot shop, cold shop, kiln room, flameworking shop, mold room, and flat working area. The hot shop has six glory holes ranging in size from nine to 36 inches, two 1,000 pound furnaces, and a wide range of annealers. The cold shop features heavy equipment such as belt sanders and can be easily cleaned by hosing down the equipment into large grated floor sinks. The studios also feature a dedicated kiln room with 14 kilns and a mold shop. The lampworking studio houses workstations for 15 artists and a variety of torches at each station. Studio artists are able to rent a variety of different types of storage spaces for their equipment, materials, and projects, and may utilize a lounge and showers. Please note: Our studios are closed to the public. If you are interested in visiting our studios, please join one of our free tours, which are held every Saturday at 1:00 and depart from the Agnes Varis Art Center on the corner of Fulton St and Rockwell Pl (no reservation needed). If you are an artist interested in renting and would like to view the studios, please contact rental@urbanglass.org. For questions about accessibility, please contact Director of Operations Brian Kibler. UrbanGlass’ Atelier acts as an interface between the New York visual art, sculpture, design and architecture communities. Recent commissions include work done with Dakota Jackson and Eva Zeisel, Tom Otterness, Tony Oursler, and Tsao & McKown Architects. For more information & to submit a request, please click here. UrbanGlass' studios are generously supported by the New York City Department of Cultural Affairs, the Dana Foundation, the New York State Council on the Arts, the William Talbott Hillman Foundation, the Wolf Kahn & Emily Mason Foundation, and many individual donors.